From the top to the bottom of the screen are various panels, which are shortly described here. For more thorough explanations, please click HERE. Please note that each panel can be shrunk or stretched by moving your mouse between two of them and drag’n’dropping the anchor. Also, each panel can be accessed via the F1, F2… keys. Remember them, as they will be really useful! This panel shows one Vu-Meter per channel. This is nice, but also interactive: a click mutes/un-mutes the channel, a right-click does the same for all the other channels. This panel will show the sequence of your tracks, for every channel, as well as the height of each of them. Note also the speed and event tracks. 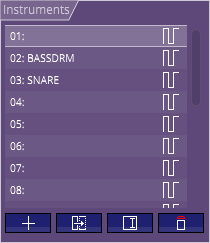 The first allows to change the speed of the song while it is played, the second helps you communicate with the player by sending numbers (to help you synchronize your demo on the song progress, for example), but can also be used to play sample such as digidrums. Basically, one column represents one pattern, which holds the tracks you will be hearing. It is also possible for a pattern to reference the same track as many times as you want. No need to copy/paste tracks that sound the same! This both saves memory and your time. By clicking on the Tracks/Transpositions icon , the tracks switch to transposition: by default they are set to 0, but try modifying them: the track will go up and down according to the number you enter, in semi-tones. Expression means “arpeggio” or “pitch”, which can be selected via the toggle button at the top left of the panel. An expression is a list of values that will be used by the Arpeggio and Pitch effects, within the tracks. An arpeggio is a succession of semi-notes offsets to sound “as if” a chord was played on the same channel, whereas only one note is actually played at the same time. For example, a minor chord would be 0, 3, 7, a major 0, 4, 7. A pitch is a frequency offset to add to the sound being played. In effect, you can create vibratos, such as 0, 1, 2, 1, 0, -1, -2, -1, or any other funny effect you could invent. Using an expression requires you to first create it, then use it in a pattern, triggered by an effect, in the pattern viewer, described just below. The instruments of your songs are listed here. The buttons at the bottom allows you to create more. More information here. This is where you lay your notes within the displayed tracks. Where you actually compose the song! It is described in details here. Your song relies on the notes you enter, but without instrument, nothing can be heard! Clicking on the “Instr.” button to the left of the panel reveals the instrument panel. Don’t be frightened by the somewhat overwhelming amount of data you see: it is simple yet effective, and explained here. This panel is useful whenever you need to create or tweak an instrument. By using your keyboard or the virtual piano, the currently selected instrument starts playing. You can also change some parameters applied to it by using the several drop-downs above the piano. More information here.